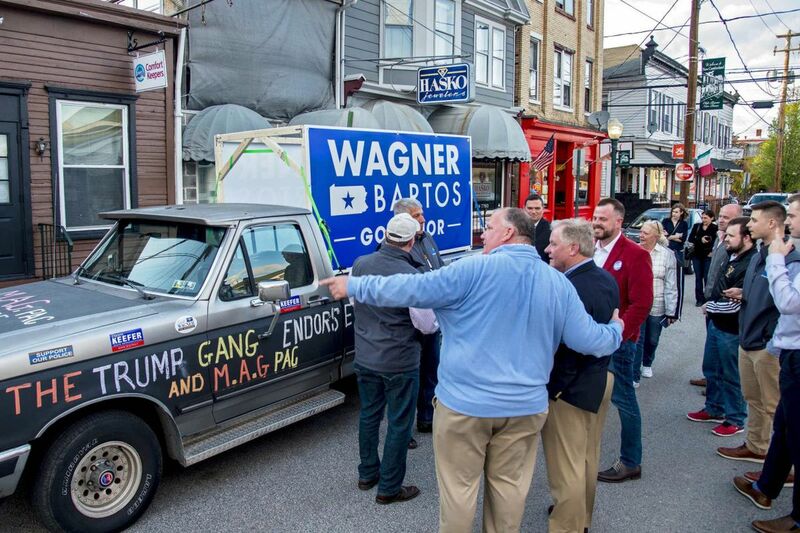 New Cumberland mayor Mayor Doug Morrow (back to camera) shows candidate for the Republican nomination for governor Scott Wagner the “Original Trump Truck” used during the 2016 presidential election, as Wagner meets and greets supporters at Fratelli’s Towne Tavern in New Cumberland April 29, 2018. NEW CUMBERLAND, Pa. — It's early on a Sunday evening in a cramped banquet room above a neighborhood bar near Harrisburg. State Sen. Scott Wagner sits at a table, nursing a Coors Light and punching numbers into his cellphone as a small crowd chatters around him. Soon, it's showtime, and Wagner — Republican senator, millionaire businessman, and the GOP's endorsed candidate for governor — rises and strides to the front of the room to address a group decidedly in his corner: fiscal conservatives who believe in good jobs, fewer taxes, and a government that stays out of the way. Scott Wagner waits his turn as Chris Del Vecchio records video of other speakers at Fratelli’s Towne Tavern. Those numbers he was punching into his phone? He tells the crowd it's the total amount of extra money Pennsylvanians will see in their paychecks thanks to President Trump's tax cuts. As he speaks, Wagner jumps from topic to topic: The natural gas pipeline. Beefing up the state's skilled labor workforce. Zero-based budgeting. And then it happens. His voice rises. His face flushes. He begins to gesticulate. "Tom Wolf should be charged with something," Wagner bellows, as the crowd cheers and he puts on raw display of just how incensed he is that the governor, a Democrat, received a $1 million campaign donation from a political action committee that includes donors opposed to legislation the governor later vetoed. "I've had it with this guy. … We are going to get rid of this guy, and you're going to help me." It is quintessential Wagner: moving from 0 to 60 on the emotion speedometer in less than a minute, a quality reminiscent of former Gov. Ed Rendell, whose flashes of temper became legend. That rage is a trait for which Wagner is either reviled or revered, and one that he has put on unabashed display during a short yet dramatic political career. "I live by this motto: 'Don't do as I say, do as I do,'" Wagner said in an interview. "I'm willing to get my hands dirty. … I mean, I do it over here at the Capitol. If I walk in one of the bathrooms [and] somebody threw a paper towel or something on the floor, I pick it up. I wash my hands after." The president of a York County-based waste-hauling company, Wagner wants to be Harrisburg's "cleanup guy." He advocates for smaller government and limited spending, and argues that public-sector unions have too much influence. The president of a York County-based waste-hauling company, Wagner wants to be Harrisburg’s “cleanup guy.” He advocates for smaller government and limited spending, and argues that public-sector unions have too much influence. Wagner holds himself out as the polar opposite of Wolf, who earned multiple degrees from elite schools and who rarely departs from his professorial demeanor. Wagner grew up on a farm, shoveled horse manure at age 10 — for a $5 weekly wage, he says — and skipped a college degree to launch what today is a $75 million waste-hauling business that holds scores of municipal contracts. Where Wolf is quiet and thoughtful, Wagner is brash and unpredictable, often drawing comparisons to Trump, whom Wagner once jokingly referred to as "a mini-Wagner." What is more certain: Wagner is seeking to pull off in Pennsylvania what Trump accomplished in 2016, eking out a victory even without help from the populous and politically moderate Southeast. "He's different and he's daring," said John Kennedy, a former state legislator who a decade ago helped launch a conservative Republican group called Citizens Alliance of Pennsylvania (CAP). The group, among other things, targets so-called RINOs — Republicans in name only — in primaries, and tries to replace them with people they believe will stay true to what they consider the party's beliefs. "With him, anything can happen," said Kennedy. First, Wagner will have to edge out two competitors in this month's Republican primary: Pittsburgh-area lawyer Laura Ellsworth and former health-care consultant Paul Mango, who is also from Allegheny County. Wolf has no primary challenger. In the race, Wagner and Mango have jockeyed to outdo each other in appealing to conservatives, while Ellsworth has positioned herself as above political shoving matches. The state party endorsed Wagner and his running mate, Jeff Bartos, even though Wagner made his reputation (and headlines) bucking the establishment. Wagner is embraced by Steve Johansen (left) after speaking at the meet and greet sponsored by the Facebook group and PAC “Make America Great,” founded by Johansen. His start in politics was anything but conventional. Kennedy likes to say it started with an overturned trashcan on pickup day in his neighborhood in the winter of 2010. When Kennedy looked out the window, he saw that a worker manning the garbage truck was on his hands and knees picking up the litter that had scattered in Kennedy's yard. "I turned to my wife and told her I was going to call the owner of that company and thank him," said Kennedy. That owner was Wagner, who runs Penn Waste Inc., a York-based company with more than five dozen municipal contracts in central Pennsylvania. The two got to talking about politics, and Wagner told him he was tired of giving money to politicians who made promises they never keep once they get into office. Wagner's beef? Overly onerous government regulation. When Kennedy told Wagner about CAP, he said Wagner "looked at me and said, `John, you're the lunatic I've been looking for for 20 years.'" Wagner quickly became one of the organization's most generous benefactors. By 2013, he was running a self-financed state Senate campaign. Despite opposition from major Republican players, Wagner won a 2014 special election as a write-in. That November, he was elected to serve a full four-year term. The establishment took notice. No sooner had Wagner arrived in the Capitol than he was given a plum: running the Senate GOP's campaign committee, a position that gave him sway in choosing candidates and propping up their campaigns with cash — sometimes his own. Under his watch, Republicans grew their majority in the Senate from 31 to 34 seats in the 50-seat chamber — their largest majority in more than a half-century. Some new senators he helped elect are more conservative than the norm in a body known for being ideologically temperate. At the same time, Wagner struck more moderate stances on some economic and social issues, proposing to raise the minimum wage — although not by as much as Democrats would like — and supporting anti-discrimination protections for LGBT residents. But his main focus has always been taxpayer money: how state government (too big!) spends too much of it, and public sector unions (too powerful!) demand too much of it. How he expresses those views sometimes commands as much attention as the opinions themselves. There was the time he threatened to use a baseball bat to keep Republican leadership in line. And the time he likened unions to Hitler. And the time he interrupted a speech to confiscate a video camera from a campaign tracker who followed him into a private club. "He may be a bull in a china shop at times, but that's part of his charm and part of why he is successful," said Senate Majority Leader Jake Corman (R., Centre), who considers Wagner a friend. "You need members like that to challenge the status quo." Democrats have branded him as dangerously anti-worker — Wagner, whose Penn Waste employees are not unionized, is one of the loudest backers of the so-called paycheck protection bill. Critics have called him a bully and ruthless, pointing to Penn Waste's legal pursuit of people with unpaid trash bills of $250 or less. Opponents have blasted him for refusing to release his tax returns, and for saying he would not relinquish, even temporarily, ownership in his businesses — some of which are regulated by state government — if he were to become governor. "Scott Wagner is the very worst of Harrisburg," said Beth Melena, a spokeswoman for the state Democratic Party. It's not just Democrats who have choice words for Wagner. Mango, his rival in the May 15 primary, released an attack ad last month that, among other things, took aim at Penn Waste's environmental record and suggested that Wagner, who years ago was once the subject of a protection-from-abuse order from his older daughter after an argument, is "violent." Wagner's campaign called the attack "despicable." Still, there is a side to Wagner that relishes getting under people's skin. It is no accident that he set up his campaign office directly across from the state Capitol. It was, an aide said, so Wolf would have to look at a large sign with Wagner's name on it every time he leaves work. And, as Wagner likes to point out, he didn't create Harrisburg's financial problems, namely, its deep pension debt — what's left unsaid is that the GOP-controlled legislature had a big hand in that. He just wants to be the one who cleans it up. Wagner poses for a photo with his campaign policy director Shauna McLanahan (holding 18-month-old daughter Lily) following the event in New Cumberland.